AFC Telford United have brought in former Aston Villa and Wolves defender Rob Edwards as their new manager as part of a major shake-up at the National League North club. The Shropshire side have parted company with manager Rob Smith and his assistant Larry Chambers. BBC Radio Shropshire reports that this is all part of a plan that will provide new investment to secure their future. "It was tough to part with Rob (Smith) and Larry," said director Andy Pryce. "But Rob (Edwards) is a Telford lad, who had a successful career as a player and has since gone on to make a very good start to his coaching career." "This is my hometown club," said Shropshire-born Edwards, 34, who was heavily linked with the manager's job at Shrewsbury Town earlier this year. "I will be working very hard to see what we can achieve and hopefully see the football club raise its profile to a new level." 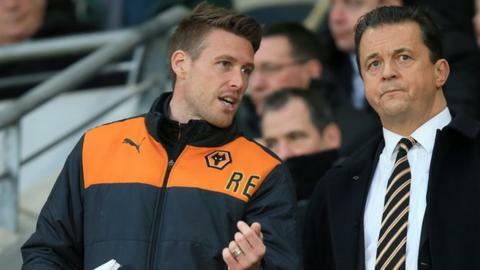 Edwards returns to football four weeks after leaving in Wolves in May, when he departed Molineux along with boss Paul Lambert and the rest of his backroom team. AFC Telford were formed by fans in 2004 following the liquidation of the old Telford United, famed in the 1970s and 1980s for their non-league FA Cup-fighting exploits. Since being reformed, in the eighth tier of English football, the Bucks have twice been promoted to English football's fifth tier, in 2011 and 2014, only to be relegated in 2013 and again in 2015. They have now spent two seasons back at sixth-tier level, finishing 18th in 2015-16 and 17th in 2016-17. After seeking new investment in October 2016, an American-based Telford fan made an official approach for his hometown club. But the then fan-owned club's constitution, run by a Supporters' Trust, would only have allowed him to initially invest no more than 20%. The club, who last year tried to raise £50,000 in extra income to improve a cashflow problem, have since changed their structure. "Obviously this is a pretty major development for the club. We caught wind that something was happening after the first scheduled pre-season training session was cancelled on Tuesday. "Then today I was told that Rob Smith and Larry Chambers have left the club. This is as a result of new investment coming in, which I'm told is an offer too good to turn down. "I'm also told the club's chairman Ian Dosser is leaving and Andy Pryce will be interim. This isn't a takeover and nothing will change as regards the current share structure or the name of the club. "But I think it's a game-changer. We're talking pretty major investment and the prospect of some Football League players joining on loan. "Sources also tell me that Telford are to receive additional financial support from Wolves, on top of their current agreement, in which the Championship side pay to use Telford's Bucks Head home to stage their Under-23 games."